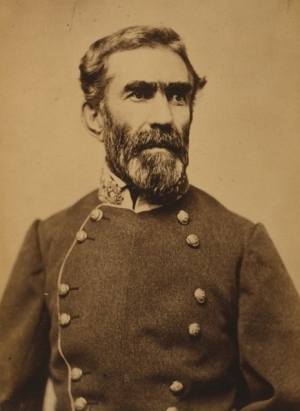 Braxton Bragg was a Confederate general during the American Civil War who served as a principal commander in the Western theater and later as a military advisor to Confederate President Jefferson Davis. During 1862 and 1863 especially, Bragg opposed various Northern armies led by Ohioans Ulysses S. Grant and William Rosecrans. Braxton Bragg was born on March 22, 1817, in Warrenton, North Carolina. His father was a carpenter and his younger brother, Thomas, was the future Confederate States Attorney General. In 1833, Bragg entered the United States Military Academy and graduated fifth in his class in 1837. Following his graduation, Bragg entered the United States Army as a second lieutenant on July 1, 1837. As a young army officer, Bragg fought in the Second Seminole War (1835-1842) and the Mexican-American War (1846-1848) and was promoted to the rank of captain in June 1846. During the Mexican-American War, Bragg became friends with Colonel Jefferson Davis, commander of the Mississippi Rifles and future President of the Confederate States of America. At the conclusion of the Mexican-American War, Bragg returned to frontier duty, where he acquired a reputation as a strict disciplinarian. His rigid adherence to military procedure reportedly led to two attempts on his life by subordinates in 1847. On June 7, 1849, Bragg married Eliza Brooks Ellis at Terrebone Parrish, Louisiana. He continued his army career until January 1856, when he resigned his commission to become Commissioner of Public Works for the State of Louisiana as well as a sugar planter. During his civilian life, Bragg served as a colonel in the Louisiana Militia. When Louisiana seceded from the Union (January 26, 1861), he was promoted to major general of the militia on February 20, 1861, commanding the forces around New Orleans. On March 7, 1861, Bragg was commissioned as a brigadier general in the Confederate Army and put in charge of the Department of West Florida. He was promoted to major general on September 12, 1861. In early 1862, Union forces were threatening western Tennessee. Bragg was ordered to move his forces to Corinth, Mississippi to help stop the Federal advance. On April 6-7, he served as a corps commander under General Albert S. Johnston at the Battle of Shiloh. After Johnston was killed during the battle, Bragg was promoted to the rank of full general on April 12, 1862. On June 27, Confederate President Jefferson Davis named Bragg to replace P.G.T. Beauregard as commander of the Army of the Mississippi, which was renamed the Army of Tennessee in November. Bragg's first campaign as commander of the Army of the Mississippi was an invasion of Kentucky in August 1862. Bragg moved his forces from Tupelo, Mississippi to Chattanooga, Tennessee where he began his advance north into Kentucky. Between September 14-17, he defeated a Union army, commanded by his brother-in-law, Don Carlos Buell, at the Battle of Munford. A few weeks later, a wing of Bragg's army commanded by Major General Leonidas Polk met Buell's army at the Battle of Perryville (October 8, 1862). Although the Federals suffered more casualties, Bragg chose to retreat and join with Kirby Smith's army at Harrodsburg, Kentucky. Smith and two of Bragg's subordinate officers, Leonidas Polk and William J. Hardee, urged Bragg to continue the campaign, but with winter approaching, Bragg instead withdrew to Knoxville. The invasion of Kentucky proved to be a strategic failure. Bragg was criticized in the Southern press and called to the Confederate capital at Richmond to respond to demands by fellow officers that he be replaced as head of the Army of Tennessee. President Davis decided to allow Bragg to continue his command of the army, but Bragg's relationship with his subordinates was irreparably damaged. When Bragg returned from Richmond, he withdrew his forces from Knoxville to new defensive positions around Murfreesboro, Tennessee. When the North's Army of the Cumberland, now commanded of Major General William S. Rosecrans, approached Bragg's defenses, Bragg decided to attack on December 31, 1862. The ensuing Battle of Stones River (also known as the Battle of Murfreesboro) resulted in a tactical draw, but Bragg decided to withdraw to Tullahoma, Tennessee on January 3, 1863. Once again, Bragg's subordinates lobbied for his dismissal. President Davis left the decision up to Bragg's superior, General Joseph Johnston, who decided to retain Bragg. During 1863, Rosecrans continued his offensive, driving Bragg from his defensive positions at Tullahoma in June and out of Chattanooga in September. Throughout this period, the Confederate cause was hampered by dissention within the chain of command. On several instances, Bragg's subordinates refused to follow orders that he issued. In mid-September, Bragg's fortunes changed. With his army reinforced, Bragg decided to turn on Rosecrans as he pursued the Southern army into northern Georgia. From September 19-20, Bragg's army won the greatest Confederate victory in the Western Theater of the American Civil War, when it defeated the Army of the Cumberland at the Battle of Chickamauga. Bragg drove the Federals back to Chattanooga and laid siege to the city. Despite the Confederate victory, Bragg's subordinates continued to snipe at him. The dissidents secretly prepared a petition to President Davis to have Bragg relieved of command. Davis once again decided to leave Bragg in command, denouncing the petitioners. Nevertheless, Bragg's days in command were numbered. In late November the besieged Federals in Chattanooga, now commanded by Ulysses S. Grant, began a breakout. Union assaults on Lookout Mountain (November 24, 1863) and Missionary Ridge (November 25, 1863) drove the Confederates back into northern Georgia. On December 2, 1863, Bragg resigned his command of the Army of Tennessee. In February 1864, President Davis recalled Bragg to Richmond where he served as a military advisor for the remainder of the war. After the Civil War, Bragg served as the superintendent of the New Orleans waterworks, the chief engineer for Alabama, and a railroad inspector in Texas. He died at Galveston, Texas on September 27, 1876. Braxton Bragg is buried in Magnolia Cemetery, at Mobile, Alabama. In 1919, Fort Bragg, in North Carolina, opened and was named in his honor.